RMS Skip Hire provides unmatched waste management, wait and load, and skip hire services in Lewisham. We have a wide range of skips that are ideal for domestic, residential and commercial projects. Our skip hire and waste management professionals make it their priority to address all your queries and concerns linked to skip hire and waste disposal. Whether you have doubts concerning the price of the skips, their size, or how we process your waste, our team is always ready to help you. We have a track record of offering the most affordable and efficient waste management and skip hire solutions in Lewisham. Our key objective is to maintain complete transparency while dealing with each client. It not only deepens our mutual trust but also creates a strong foundation for a long-lasting business relationship. We focus on offering customized skip hire and waste management solutions to meet the individual needs of our clients. Yes, whether you need skips for managing the waste generated from a home renovation project or a full range of waste collection and processing services for a commercial project, you can rely on RMS Skip Hire without giving a second thought. If you do not have adequate space to put skips on your premises or job site, we can also arrange a skip hire permit for you. 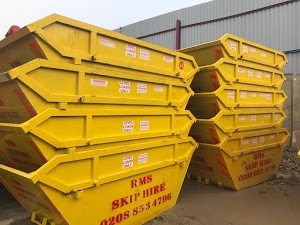 So, if you are looking forward to taking the advantage of inexpensive skip hire and eco-friendly waste management solutions in Lewisham, don’t hesitate to contact RMS Skip Hire immediately.